We just completed the first round of learning circles in Detroit, in partnership with Libraries Without Borders. 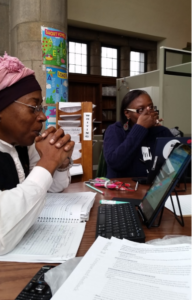 Two learning circles were held at the Parkman Branch of the Detroit Public Library (DPL) and one was held at The Matrix Center. In addition to running the three learning circles, P2PU and LWB trained 18 librarians and library administrators on how to launch learning circles in their own branches, and two alumni of our program have committed to become facilitators for their own learning circles in the new year. DPL facilitated two learning circles at the Parkman Branch: User innovation and entrepreneurship (edX) and resume writing and interview skills (Saylor). The User innovation course had 8 participants, 6 of whom worked together to get through the entire course. Participants came for very different reasons: some learners came simply because they were curious or because they wanted to prepare to re-enter the workforce, others came because they had developed business ideas and wanted to hone their entrepreneurial skills. These courses were chosen by Q, a Parkman Branch Librarian who based her decision on what she was hearing patrons asking for most frequently. 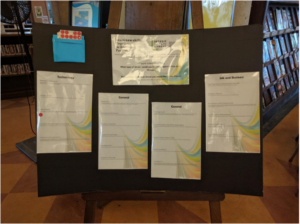 Towards the end of the program, Q designed a great way to advertise next year’s learning circles while remaining responsive to the needs and interests of the community members. 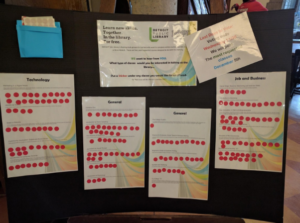 She created a poster board with a list of online courses that P2PU has used in the past for learning circles and stood it up near circulation with a pack of stickers. Over the course of a month, patrons wandered by and put stickers next to the courses that they’d be interested in participating in a learning circle. The most popular courses would become learning circles in the new year. The most popular course with 20 votes was Marketing in a Digital World (Coursera). There was a tie for second place – Introduction to Public Speaking (Coursera) and Social Entrepreneurship 101 (NovoEd) both received 16 votes. To start 2017, Parkman Branch will offer both the marketing and public speaking courses. Additionally, they will run another round of the user innovation course, facilitated by two of the participants from this past round. So say hi to the newest learning circle facilitators Stella and Marion!